We wish you all a wonderful 2017 and look forward to you visiting when you will be 'Never Knowingly Over-Crowded' and there is a good possibility of resetting a PB or two. Manor Fisheries will OPEN on Saturday 25th March and CLOSE after Monday 2nd October 2017. Fishing "Availability" can be seen up to 6-months ahead via the "Availability" tab. A Booking request for "Accommodation and discounted Fishing" for 3, 4 and 7 nights (or longer) throughout our 2017 Season. A Booking request for fishing up to 6 months ahead from a 2017 Night Member by including their Night Membership number (and for each angler in their group). A booking request 3 months ahead for those requiring only Day Fishing (7.00 am to 7.00 pm). Our new website kicked smoothly into life on Friday 6th January 2017 and you will find it has a number of new features. This includes reading information more easily when using your Internet enabled phone. Visit our Availability tab where you can see current availability of fishing (and Apartments). Many thanks to Terry Keard for providing several of the new photographs for our website and includes that showing on our Home page. 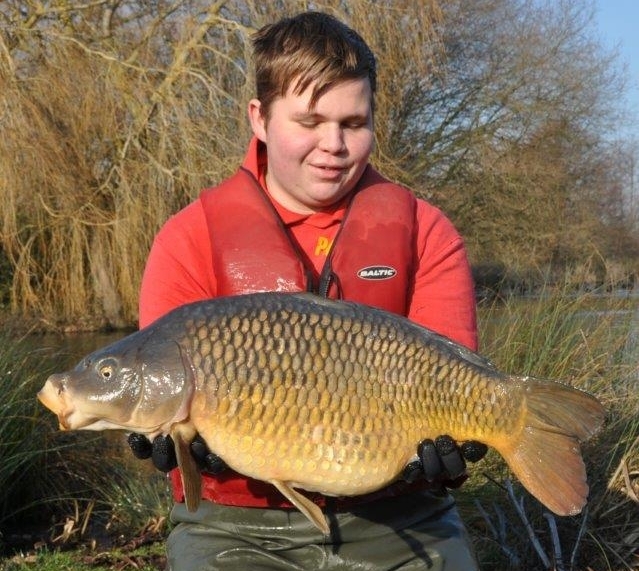 All anglers are encouraged to submit their Manor Fisheries photographs for publication. Each month we plan to refresh our website Home page with the most interesting photograph relating in Manor Fisheries. Thank you to all those anglers who in the past have spent a few moments to summarise their catch in the Cabin Log Book. This information forms the basis of our Monthly Report to keep all anglers informed of what has happened. To provide an informative monthly summary every angler is urged to share their catch details in the Log Book provided and forward their pictures. With the lakes now closed for the winter period it has proven to be a good opportunity to carry out various lake maintenance tasks. During sunny weather on Saturday 29th October last year, a Working Party armed with their sharp gardening saws, shears and long poled loppers tirelessly removed an enormous quantity of overhanging branches from all three lakes. This will reduce the number of break offs and expose more sunlight to previously over grown areas of water. We extend a very BIG thank you to Gary Deacon, Terry Keard, Kevin Oxley and Jason Tuckey who again all volunteered to assist in this annual task. The brambles and debris taking over the whole surface of the island have been cut back and burnt. With the valuable assistance of Hadlow College on the 11th January, the cold weather did not deter students and staff performing electro stunning and netting – see below. A couple of 10lbs+ Carp were safely relocated to Lake 1 (Carp) and three rogue Catfish were discovered! Two were doubles and one was 20lbs+ and they were all rehomed to Lake 2 (Carp/Catfish). Major repair work to the “Cat Alley” swim (between L3 and L2) completed. It had become apparent 2-years ago that the Lake 2 (Carp/Catfish) biomass was becoming too high and this month another reduction plan was successfully initiated. As a result of valuable assistance from Hadlow College in icy conditions on the 18th January – see below; 44 x Catfish weighing a total of 444lbs were re-homed to a new location and 11 x double figure Carp to 20lbs and weighing a total of 162lbs were transferred to Lake 1 (Carp). Netting Lake 2 after breaking the ice. The rampant spread of brambles taking over the whole surface of the island have been cut back and burnt together with cutting back several overhanging island branches. On the 18th January a further 11 x double figure Carp to 20lbs and weighing a total of 162lbs were transferred from Lake 2 (Carp/Catfish); resulting in Lake 1 (Carp) now containing approximately 150+ doubles.